NEENAH, Wis. (AP) — She begins each time by sharpening her tools, with the sound of metal on metal echoing through the sunlit old house she calls both home and workshop. Making a violin is a methodical art. For Sonja St. John, that structure is a necessity — and the routine, in many ways, a saving grace. “It’s a way to stay on track even when chaos can be happening right outside,” she says. 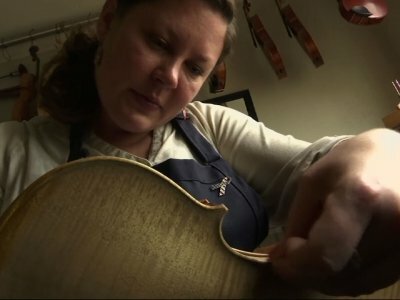 She finishes each new violin with another ritual, by gluing a small, handwritten message inside. This began as a light gesture, with favorite fortunes from cookies placed inside with a wink as hidden signatures of sorts from her, the violin maker. But the notes she leaves now have become far more personal and meaningful. The person foremost on her mind when she writes those messages is her brother, Jon St. John, an Army specialist who died a decade ago when a roadside bomb exploded near the military vehicle in which he was the gunner. Jon, Sonja’s only sibling, was 25. She was 22 and just beginning her career after graduating from the Chicago School of Violin Making. She has a vivid memory of sliding to her kitchen floor, her back against the cupboards, when her parents shared the news in a phone call. This was her big brother, her fishing buddy and protector, tall and strong-willed but also kind in sometimes surprising ways. Her favorite photo of the two of them together was taken at one of her violin recitals in 2002. He’d come home from college, wearing what she figures was probably his nicest sweater, and brought her flowers. “He was just always a good friend to have around,” she said, noting how music had always been a bonding point for them. He’d teach her about his favorite rock bands. She introduced him to jazz violin. But in the years after his death, Sonja stopped playing, as grief enveloped her. She got married in 2008 and divorced seven years later. After moving back to Neenah, her Wisconsin hometown, to be near her parents, she increasingly tried to drown that grief with alcohol, so much so that she checked into rehab more than once. “I was very sick for quite a long time,” she said. Her grandmother had died of heart problems shortly after Jon’s death but, as Sonja saw it, she really died of heartache. Truth was, her own heart also had been broken for years. Then, last fall, she received a note from Jason Moon, a musician and himself an Iraq war veteran whom she’d first met as a teenager, when they played music together. Moon had had his own struggles, with PTSD, after coming home from the war. He hadn’t been able to offer much support when Jon died, he said, but things had changed for him in recent years. Now the head of a nonprofit arts organization for veterans, called Warrior Songs, Moon asked Sonja if she’d be interested in helping create a song for his group’s second album. This one will focus on telling the stories of women in combat, as well as the mothers, wives and sisters who’ve lost loved ones to war. The Warrior Songs CDs are given free of charge to veterans and are intended to be a source of support and healing. In honoring Jon — and telling her own story — Sonja, now 33, also saw a chance to move forward and to stay sober. She agreed to play a violin solo for the song and soon began practicing again. She also began building a new violin, work she’d set aside to focus on instrument repair. “Hey brother, where you gone?” the song begins. “It’s been too long since you’ve been home. This month, Sonja recorded the violin accompaniment for the song at a studio in suburban Milwaukee. Her parents, Kay and Jon Sr., were there, too. They recalled the son who, in 2005, showed up with Army brochures to tell them he’d be leaving in 36 hours for basic training at Fort Hood, Texas. “You know there’s a war going on?” his mother recalled saying to him. “Yes, I do,” he said with a determined look. Though worried, his parents gave him their full support. Now their daughter is the major focus. “Who knew what kind of healing would come from this process?” Moon said of Sonja’s personal journey in helping create the song, which is being released this weekend on the Warrior Songs website. Still, it was clear that she was nervous. She’d never played in a recording studio before and was still feeling rusty. To help keep her calm, she placed photos of Jon on a nearby music stand. Then she played a solo that would, like the song itself, become a message of another kind, much more public than those slips of paper hidden inside a violin that may never be seen.